A Greek legend tells a story of the flower blooming from the blood of Hyacinthus, a youth accidentally killed by Apollo. Remembrance is the meaning tied to it. Unlike the more delicate lily of the valley, everything about hyacinth is bolder and more vivid–the masses of star shaped flowers on thick stems, the heft of blossoms, the headiness of perfume. This intoxicating sweet fragrance, almost oily in its magnificent richness, has been praised in the Persian poetry, mentioned in the Bible as Lily of the Valleys and loved by the Marquise de Pompadour. It inspired people to sell their possessions during the bulb craze of the seventeenth century and influenced perfumers to capture the enthralling fragrance which is rich, voluptuous, yet intriguingly spicy and green. Indeed, its unique qualities make hyacinth a fascinating note to explore. The jewel-toned, succulent petals of hyacinths are stubborn in giving away their essential oils, and although the oil of hyacinth is used—usually in the costliest of perfumes, the note tends to be rendered via synthetic means. Traditionally, the hyacinth note would be constructed as a base, relying on several different aroma-materials to provide a desired effect—phenylethyl alcohol for a rosy touch, benzyl acetate for a fruity jasmine facet, cinnamic alcohol for a spicy edge, etc. Indeed, the same materials can be used in different proportions to create jasmine, lilac, lily of the valley or hyacinth bases. As a result, unless the base has a strong character, when used in a composition, it tends to vanish into a nondescript floral effect. However, when the accords are successful, the results can be truly excellent. The verdant leitmotif running through the legendary Chamade by Guerlain is reinforced by the freshness that hyacinth brings to the arrangement. The harmony of its seamless green notes is so remarkable that it is impossible not to marvel at the genius of the composition. Framed by the woody-ambery accord enriched with vanilla, the green floral notes possess the quality of heavy opalescent satin that veils a beautifully sculpted form. A green accent is the main role of hyacinth, which it can play equally well in both feminine and masculine fragrances. It lends a fresh touch to mango in Hermès Un Jardin sur le Nil, softens galbanum sharpness in Chanel No. 19 and Balmain Vent Vert, and adds complexity to the green accord of Jil Sander Woman III, a ravishingly sensual chypre with traditionally masculine notes. Since hyacinth and lily of the valley and especially their corresponding aroma-materials tend to lack the fruity sweetness, they are the notes of choice for masculine compositions. The classical lily of the valley synthetic is hydroxycitronellal. Lilial, an aroma-material with the fresh, floral character reminiscent of lily of the valley and cyclamen is used both in the masculines like Paco Rabanne by Paco Rabanne and the feminine fruity-florals like Prescriptives Calyx. Marc Jacobs for Men layers its fig accord with a beautiful lily of the valley note provided by Super Muguet, while modern fougères like Paul Smith Men, Rome Gigli Sud Est and Calvin Klein Eternity Summer for Men amplify their aromatic top notes with the hyacinth nuance. A green hyacinth note is hidden in the heart of Nino Cerruti and Aramis Devin. A masculine fragrance with the most pronounced hyacinth note I am familiar with is Chamade Pour Homme, a Guerlain 1999 limited edition. Jean Paul Guerlain folded the accord of hyacinth, coriander and violet into the warmth of patchouli, labdanum, vanilla and cedar leaves, thus creating an interesting counterpart to his feminine fragrance. 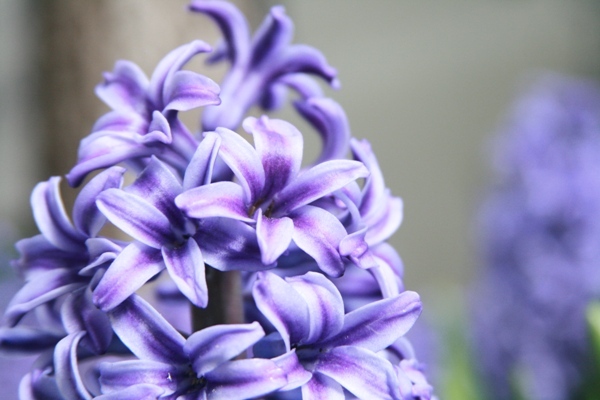 The rich aspect of hyacinth can also find its way into fragrance. Jean Patou Chaldée was first introduced in 1927 as suntan oil, and the rich sweetness of hyacinth marries perfectly with the gilded ambery base. Intoxicating like a feeling of being in love, Annick Goutal Grand Amour embellishes the voluptuous heft of hyacinth with the freshness of honeysuckle, apricot jam sweetness of jasmine and warmth of amber. The composition would have been unbearably heady were it not for an intriguing twist–a cold breath of myrrh. Another lush bouquet is Jean Claude Ellena’s composition for L’Artisan, La Haie Fleurie du Hameau. A classical floral tribute to the gardens of Marie-Antoinette in Versailles, it is appropriately luxurious, with the dominant notes of jasmine, honeysuckle and hyacinth spilling onto the oakmoss laden base. Please see Part I: Spring Flower Bouquet ~ Lily of the Valley. violetnoir: All of those fragrances contain hyacinth, V? Really? It doesn’t seem very prominent in most of them, does it? Cheezwiz: Your description of how these notes are created artificially is very interesting. From what I’ve learned hyacinth, LotV, & lilac have to be created synthetically, as its almost impossible to extract the natural oils. I am always on the hunt for fragrances containing these notes, as spring is my favorite time of year, and the bloom time for these florals is so short! portlandia: Thank you for the lovely post about one of my favorite flowers and fragrance notes. I love hyacinths in any form! Patou’s Vacances is truly a showcase for this essence, but it certainly lends character to others as well. To me it a is a fragrance note that adds a special richness and lifelike quality to perfumes; a three-dimensional feel, if you will. 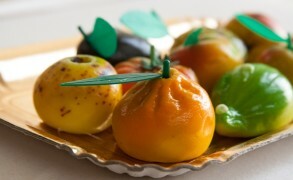 It is heady yet not sticky-sweet, always giving its vivid green personality to improve whatever it is used in. BoisdeJasmin: D, Vacances is such a beautiful composition, and it contains most of the notes that create an atomsphere of a perfect leisurely day. I think that you nailed it perfectly when you said that “is heady yet not sticky-sweet, always giving its vivid green personality to improve whatever it is used in.” It is such an interesting and complex note. Cheezwiz: I had the pleasure of trying Josephine recently as well! It is a VERY interesting scent. I didn’t pick up on hyacinth, but got a spicy/herbal vibe once the initial floral notes died down. Apparently it contains cloves and hawthorne, and I think this is what I might have smelled.